US President Obama and Indian PM Modi during the Republic Day, January 26, 2015. 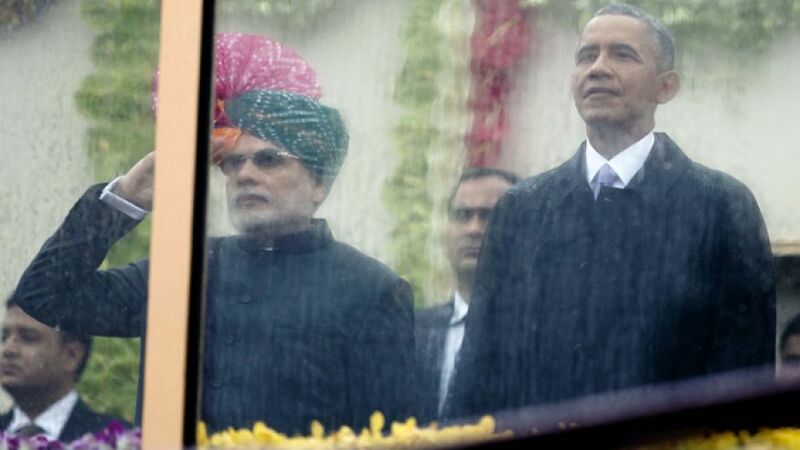 US President Barack Obama and Indian PM Narendra Modi’s esemplasy has been the distinctive characteristic evident in the 2 hour honorific celebration of India’s 66th Republic Day performance – January 26, 2015. Unusual in nature for the US President to spend such a long time in an open air event, it was marked by PM Modi’s move to take the chemistry that he first forged with Obama in September 2014 during his US visit to the next level through communicating an illustrative sense of meaning to the tableaux that marched along the Rajpath during the show to the US President frequently – something the viewers may not have seen in the past. It was a reflection of his growing friendship. PM Modi graciously explained it as ” strengthening ties between Delhi and Washington”. The pageant’s distinguishing characteristics were our military might, tableaux connected with local history, and the splendid display of unique bands. US President Obama was seen giving a quick forward motion of his head in assent throughout the show. Everyone must have been pleased. Of significance during US President Obama’s three day visit is the high voltage, high impact discussions of CEOs in business. Here again there is a precedent reinforcing the convergence of imagination between the US President and the Indian PM reflecting concurring wavelengths. “Emphasis on Manufacturing” for Growth and Prosperity is the crux. US President Obama in his State of the Union Address in 2012 mentioned ‘Advanced Digital Manufacturing’ as key to jump start the US manufacturing industry and economy. Advanced Digital Manufacturing, especially of the additive kind, has been his fascination too. Coincidentally, PM Modi has been echoing similar views, Manufacturing Emphasis for Growth, in the last three or four months to boost Indian economy and growth. 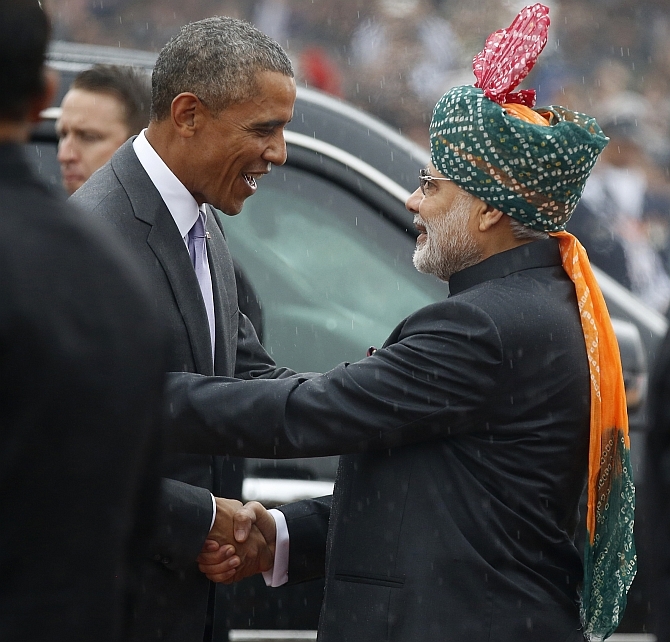 US President Barack Obama shakes hands with India’s PM Narendra Modi – January 26, 2015. US President Obama, then, announced a $ 259 million Advanced Manufacturing Project led by the University of Tennessee, Knoxville; and the Oak Ridge National Laboratory (ORNL). Car manufacturing and companies were the acushla of the initiative. 3D Printing and software development is the centerpiece of this project. A prototype car was printed at the Manufacturing Demonstration Facility at ORNL. Many car projects and functional car prototypes are now entirely 3D printed and/or made from such printed components. Use of advanced composites reduced the weight by half while improving performance and safety. More efficient, less expensive than silicon technologies and can be charged wirelessly. This is the new type of technology and job provider in the economy. Hopefully, the deliberations of CEOs will spread newfangled approaches and technologies to the theme of growth and job creation in this new age. A significant move forward like this involving many sectors will be the ‘hope’ of India Inc. Success of the visit will be when we unambiguously get a picture of the fruition of such cooperative endeavors. Indian economy needs a stimulant of this kind at this critical juncture. Tidbit : ” The two major political divisions in India are the Congress and the Bharatiya Janatha Party “.